Alternative Armies: FL19 Guild Assassins released! In the Fell Lords (FL) codes there is a pack among the warriors, adventurers, wizards, knights and more which gives me the shivers. 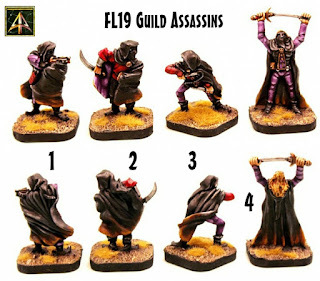 It is this pack...FL19 Guild Assassins. Not Undead, not creepy at all but rather a nightmare which will come for you in the darkness without sound. 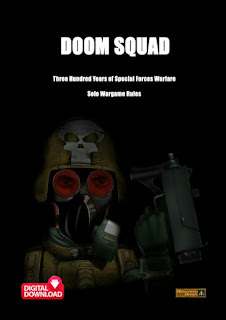 Now released. Here is a pack that needs to be in your collection. 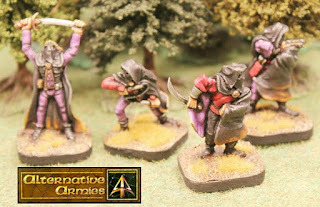 Fantastic 28mm white metal miniatures for any system. Go HERE or read on. FL19-01: Robed and Hooded assassin with hand crossbow. FL19-02: Assassin in robes and hood with curved blade. FL19-03: Assassin preparing to use the Garrotte. FL19-04: Senior assassin sword raised in victory. Thank you and order in the mail to you now! Black Friday Event next week and Kildane nears! FL10 The Winter Knight released!